In any case, this guy was close, but he only made it half way. Got himself half the expression - the "down" part, forgetting all about the "face". The resulting word, "Artza", literally means "to the ground" and is commonly used to tell a dog to lie down. You know, the Hebrew version of "Down, boy!" also "Ertze", meaning "I will want" and "Aratze", meaning "I will serve" as in "six months in jail" or "I will placate". All depending on context or chosen vowels. Bingo, Mux. A perfect after-the-fact translation. This victim can now 1) desire his chosen god 2) serve out his sentence, and 3) do it face-down, or at least down there somewhere on the good earth. Bonus: he's now got years to decide on nikud, if desired. I think you should start giving links to the pictures so we can better explore what people meant to express. Artsa also means "to the Land [of Israel]" as in "I am travelling to the Land of Israel". 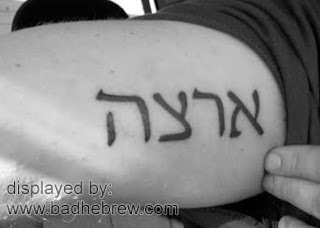 But that makes no sense by its own in a Hebrew Tattoo.